Well I’ve been here before, haven’t I. Perched very much on the edge. Hoping I’m balanced as I flow sharply backwards. I’m in the middle of the race and I’m a million miles away. I’m staring at my hand clenched around the wire fence, as footstep after footstep thumps past me and I’m utterly alone in the fells staring at the gravel track winding it’s way from one hillside to the next. The rain beats down on me as I hang from the fence, blinding me as my glasses fog up, soaking the ground past it’s ability to support my weight, letting it collapse underneath the soles of my shoes, leaving me flapping uselessly around until another racer gives me a helpful shove up the arse. Out on the lonely fellside, the recently refurbished track means I can shift back up in the big ring, glace about me and let the last warmth from the setting sun soothe the hard earned aches and pains in my back. The first marshalls out on the course fade back into the mist and murk as I start to grimace my way back down Ingleborough. 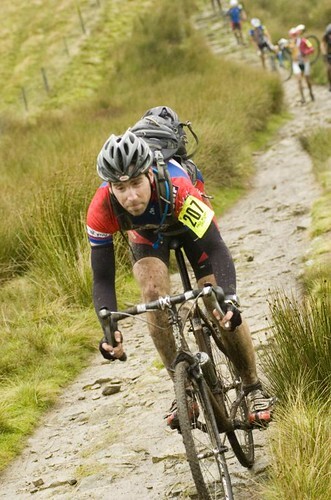 Arms embarrasingly locked as rigid as the chunky seatstays I’m bounced wildly down the hill. Less flow than the water beating me on it’s descent I feel like a shambles. The road can’t come soon enough. I’m not carving round the kinks and corners in the grassy singletrack, I’m pinballing in the slowest way you could imagine. I’m hating it. I need some sort of reprive, something to help remove the damp-through misery I’m starting to feel. I get it. I drop down underneath the perma-cloud and, as it has done every year, the views across Lancashire burst open around me. The forks judder and protest at my heavy handed, somewhat unnecessary braking and I continue to lurch from one boggy puddle to another, but I sense that I am making some progress, even if I am being massacred as far as position in the race is concerned. Somewhere far away from any roads, any envious eyes on my back and any timing equipment the fells continue to roll alongside me as I sneak my way between them, chased only by the fading blue of the sky. As per usual I make up places I’ve grovelled away on the drop down to Cold Cotes, on the road over to the foot of Whernside. I sense I’m further back in the order of the race than I have been in the past and know that another eternity of stumbling steps awaits me. Bike again on shoulder, shoes once again struggling to cope with what they’re being smacked against with little by way of grace I clip clop my way slowly up the steps back into the cloud and up into the signature Whernside Ridge Wind. As before my head is bowed and my fellow combatants become no more than pairs of confused looking cycling shoes, usually stealing past me as I slip and trip towards the second checkpoint. Hidden amongst what are beginning to feel like My fellsides, my head is again bowed, focussed again on my shoes as I build up the power pushed through the cranks. Continually. For what feels like forever until I barely touching the ground at all. Skimming over it. Scuffing the dust so lightly I begin to glance upwards to check I’m not taking off. Rabbits and hares dart out of the grass to the side of the trail and dart back in shock as I dart past them almost quicker than they can react. I find I can ride more of the descent than many around me. But my freshly battered shoulder and elbow (don’t go for “one last ride” kids) are singing in discomfort and I find myself grinding and gritching to a halt in the mud a few times as a mixture of pain and a desire to be far away from the middle of a tough morning in a tough race over even tough hills takes over. Long distance stares are called into play to remount the bike and rejoin the fight. Cresting the top of Salter Fell, long distance stares feel almost compulsary. Unspoilt wilderness welcomes me. Rolling hills, gently swooping rivers, nothing else. No pressure. No worries about how I’m doing. A few more climbs on the trail I’ve chosen. To be ridden at any speed I like. Just mine. Once again I make up places on the road section back towards Horton-in-Ribblesdale. Briefly bouyed by a car full to bursting with people cheering me on, offering me anything I need cruising past and providing me with enough cheer to power the next few Big Pedal Strokes past another group of riders. A couple jump on my back wheel and we work together until they break and I drop them. I hit the wet, hardpacked stones on the climb up Pen-y-Ghent and slither my way past rider after rider knowing how I’m dwarfed by the upcoming climb without having to look up at it. Aches and pains matched only by a desire to get to the end I offer what little fight I have to the now gravel trail. Riding becomes walking. Becomes trudging. Becomes barely moving at all. A sense that I’m willing to let the hills, the race, win begins to grow in sore muscles. I wait for the people I’ve passed on the road to dance past me again. A quick look upwards and I spot Dave Haygarth walking back down the trail. It’s no suprise that he’s a mountain ahead of me by this point, but it is a shock to see him not hurtling down the path on nhis bike. His arm is wedged in his jersey and without asking I can already tell what’s wrong. Collarbone. But it’s not going to stop him finishing, in a time that the vast majority of the race would be jealous of even with all their bones in order. He even cracks a, sort of, smile as he jokes that he’s “Done a Dave”. I offer comiserations and get back to my truding. Walking. Trotting. I’m not broken. I may have forgotten how to do anything other than grimace over the past few hours and wished the race away, but I’m still a part of it and one last push over one more hill might lessen the negative effects I’ve created for myself. I find myself starting to want to race again. My Trail, now heading definitely back down towards Slaidburn, where I’ve half abandoned the car at the side of the road, tries to catch me out with some tricky rocks sections, testing me, letting me find me desire to stay flat out over the contantly shifting surface while tucked down in the drops, finger poised around unrequired brake levers. Dusk light failing to hide the grin spreading across my face as I realise I’m racing flat out towards my mojo. Jase passes me as I head towards the summit and promises to get the beers in. Damn right, I think to myself. Beer is required here. Warren is filming the JMC boys as we step past him on our way to the last hilltop check point and I make it quite clear to him that beer is on the cards, before dibbing for the last time on the course, turning round and lurching and jerking my way back down to the finish line. In the afternoon sun worryingly refreshing ale is swigged outside the pub through post race smiles, just as, back at the car, jelly sweets are shovelled down through a wide smile. I’ve not won anything except a solitary ride over a few hills and the chance to get back the desire to push myself, but I’ve not lost anything other than a desire to quit. Good. A poor race ‘result’ but a good result from the race. Somehow. Nice one Dave. I’ve yet to find someone who had a really good race, other than Nicky of course. Great read Dave – it was a tough year. Fantastic Dave, great read. Such a crazy race, nice to hear how different people experience it.